In Southern Macedonia, we encountered an unexpected destination. 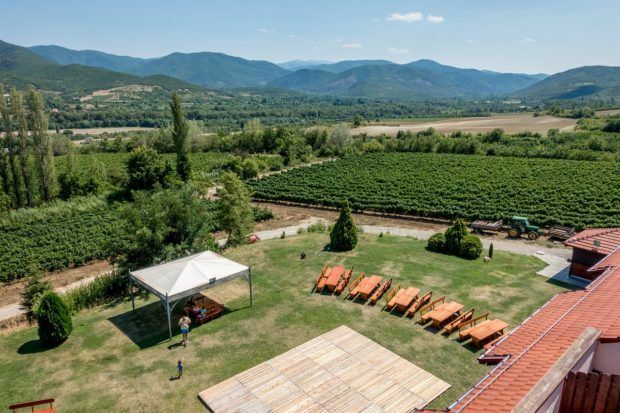 On the hills above the tiny village of Demir Kapija are located some of the most remarkable wineries you’ll ever find. It was just above the town that we discovered the castle tower of the Popova Kula winery. From the first glimpse of the building, you knew this would be special. Popova Kula is meant to be experienced with all the senses. You hear the whistle of the soft wind as it blows through the grape vines and as it kicks up dust along the dirt road. You see the incredible vibrant colors – the deep blue sky, the bright green of the grape leaves, and the dark brown of the stone and masonry. You smell the freshly cut grass and the incredible odors coming from the kitchen, offering predictions of delicious meals to come. And you taste the wines – uncommon vintages from an unusual destination. As all of the goodness sinks in, you just perceive time differently here. If truth be told, we didn’t have high expectations of Macedonian wine when we came to the Balkans. Like some of our other wine adventures in Luxembourg and Andorra, we’d never heard of Macedonian wine, much less tasted it. That it is the same latitude as Italy, Spain, and Portugal’s famed Douro River Valley should have been a clue for us. 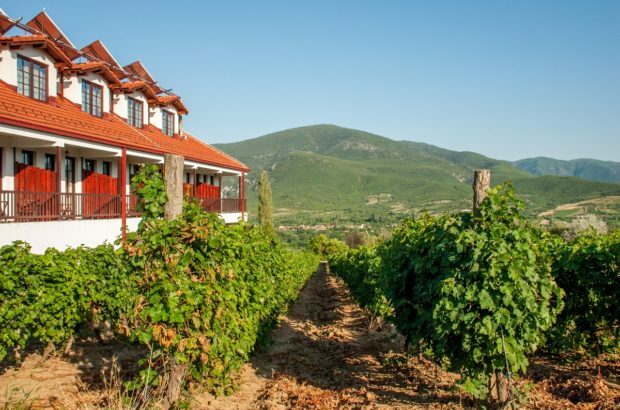 As it turns out, Macedonian wine is excellent – and incredibly cheap. The wine tradition in this area is rumored to go back over 6,000 years. They certainly have the viticulture down to a science. 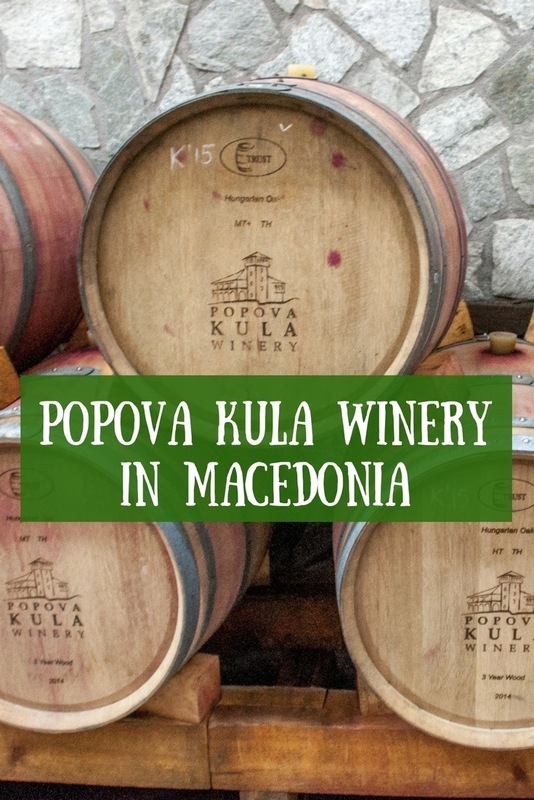 The establishment of Popuva Kula winery is more recent. 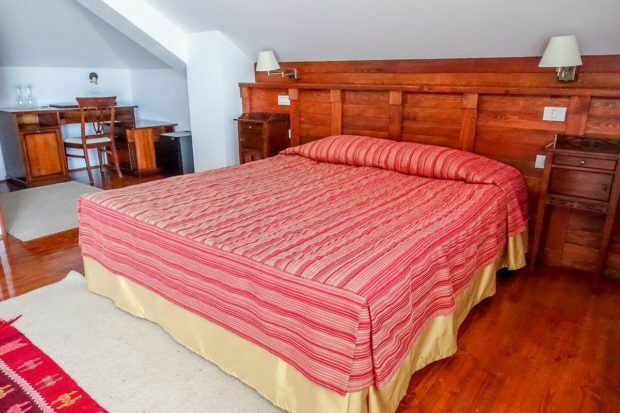 The winery began in 2004 along with the hotel, which offers a handful of rooms. There is the main lodge as well as in a purpose-built hotel on the property. We stayed in the main lodge and had incredible views of the vineyard below our window. Each morning, we were treated to the sun’s rays shining through our window – rays that reminded us of the Macedonian flag. Staying on the property is the perfect way to enjoy Macedonian wine – in the place it is created. The region was a former seabed, so it has a chalky, limestone carbonate soil. This is absolutely perfect for high acid white wines. And Popova Kula excels in this department. 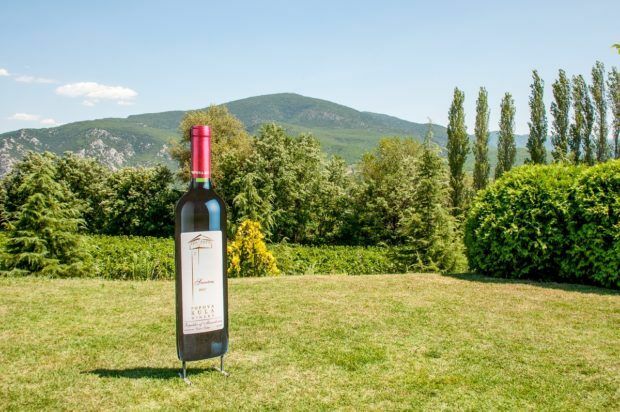 The Stanushina grape varietal is indigenous to Macedonia and thrives in the chalky soil. 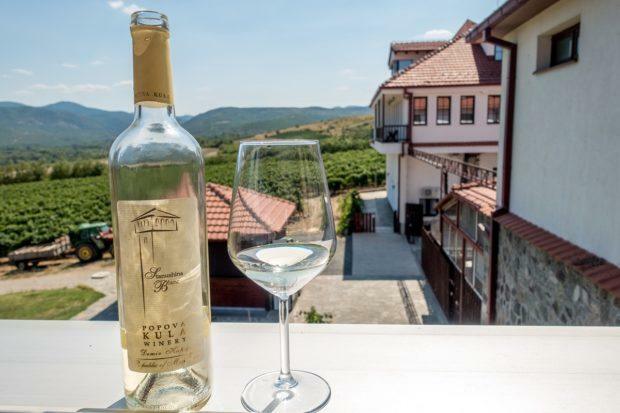 Popova Kula claims to the only Macedonian winery making a white wine from this native fruit. The Stanushina Blanc 2013 is a remarkable wine. A heavy floral bouquet with strong peach notes compliments this acidic wine. Muscat Ottonel 2015. This is a green, young, acidic wine with light floral (lilac) bouquet and subtle orange notes. It was perfect for drinking a hot day. Altan 2013. This is complex white blend of Sauvignon Blanc (50%), Temjanika (20%), Chardonnay (15%), Zilavka (10%) and Muscat Ottonel (5%). It is both fruity (peach) and herbal (basil) with an elderflower bouquet. For the region, it is quite lite on acid. 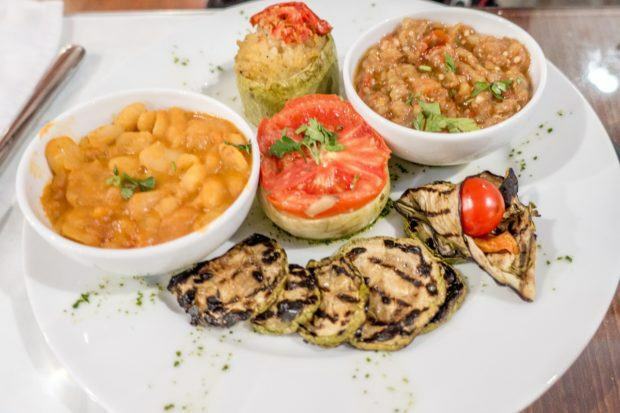 This was served at dinner paired with a tomato and goat cheese salad. Vranc 2013. 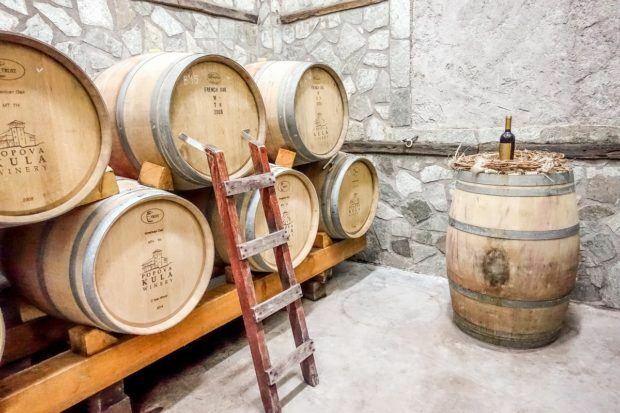 While white wines are dominant in the region, Popova Kula does have several reds. The dry red Vranc gives off cherry and blueberry notes with a smoky bouquet. We enjoyed this at dinner with roast pork and cheesy potatoes. Temjanika Sweet 2015. This dessert wine was a remarkable find. It has light straw color, but gives off honey, peach and melons. It was the perfect way to end the day! In the evening, the staff pulled a TV out on the lawn and we all watched an important soccer match. Guests and staff mingled together under the stars as the oppressive heat of the day gave way to beautiful evening. Somewhere along the way it occurred to us that this was as close to perfect as it was going to get: enjoying wonderful Macedonian wine in a beautiful setting. 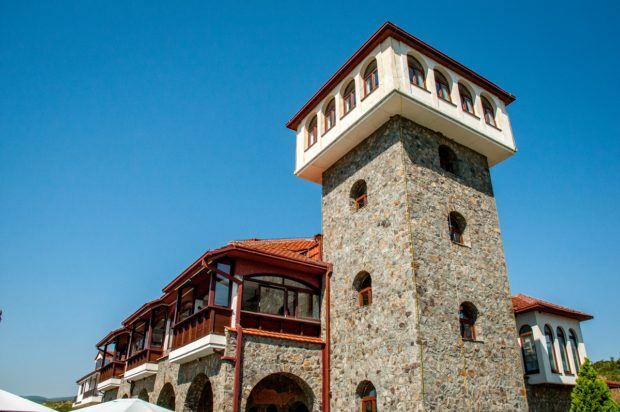 During our entire trip to Macedonia (and the Balkans), visiting Popova Kula was a highlight. We visited Macedonia as guests of JayWay Travel, operators of package tours across Central and Eastern Europe. All opinions of the bold and the blended are our own.